Strange way to travel to Galway you might think: a flight from Birmingham to Dublin and then a train ride from Dublin to Galway. Why not fly directly to Galway? Two reasons, firstly the direct flight costs were heavy because it was peak holiday time and secondly I booked this trip soon after being released from the volcanic dust, which had kept me unexpectedly stranded in Prague for four nights in April. My theory was that Dublin was less likely than Galway to be affected by the volcano. But we all know now that the volcano dust was/is of no consequence and everyone has forgotten about it as a safety issue. My plan was almost derailed by Aer Lingus as my flight was nearly an hour late touching down in Dublin. This severely cut the time I’d allowed to get to Heuston rail station. I told an airport cabbie I needed to be at Heuston in less than 30 minutes and asked whether he could get me there. He said he’d go out to the M50 and do “a hundred” – this indeed is what he did and 25 minutes later I was at the station and had a comfortable five minutes in which to take my seat on the train. I’ve been to Galway several times in the last decade but the last time I went to the races here was in summer ‘95. On that occasion I’d taken the same train journey. It’s an evocative trip, 130 miles straight through the heart of Ireland. Across the river Shannon at Athlone, through the fields of Athenry and onwards to Galway Bay. It’s strange how you associate places or journeys with particular music. I remember listening on my pre-ipod mp3 player to Jon Secada’s “Just Another Day” on this journey back in ‘95. This time I was listening to the album “The Galway Girl” by Sharon Shannon. A touch more appropriate perhaps. There are two good versions of the eponymous song on the album. One with the composer, Steve Earle and the other with Mundy an Irish singer you may not have heard of. I saw him live in Galway in 2007. That was the last time I went to a gig where there was no possibility of sitting down! On this particular train there were dual language announcements, quite often at the same time, so you had no chance of understanding what was said whether you were Irish or English. Apparently 72,000 people use the Irish language on a daily basis, but strangely I cannot recall ever overhearing a conversation in Gaelic during my last 20 years of visits. My on-time arrival in Galway meant I could catch the last courtesy coach to Corrib Village where I intended to stay for the first three days’ racing of the seven-day festival. This is a budget accommodation set-up at the University of Galway. It was impossible to get a room in Galway under £100 – except at the University which charged about £40 a night. I’d rate the accommodation OK given the price. More of this later. On Monday racing started at 5.10pm. Transport was fantastic with a steady stream of buses leaving every ten minutes or so from Eyre Square, starting about three hours before racing. Car hire would have been an unnecessary extravagance – indeed an inconvenience because the roads were constantly busy. On walking up to the entrance gates there was the usual mixture of stalls selling fruit and confectionery. But unusually there were also stalls selling firearms (rifles, pistols etc) and ammunition. No money seemed to be changing hands but perhaps there were more sales on the way out – handy if you’d had a particularly bad day. Basically day one wasn’t too clever on the punting front. I backed one winner, Robin Hood. Even that was bad value as the tote price disappeared after I placed my bet. The SP return was 9/4 but it paid just 3.00 on the machine. I was robbed! The Galileo colt was a superb specimen though, one to look out for in the future I suggest. After the carnage at the track it was back to Galway in one of the many buses waiting for punters. I needed to find somewhere to eat. Maxwell’s in Eglinton Street looked vaguely familiar. So that’s where I went. Just had a goat’s cheese salad and a huge glass of wine. Turns out it was the restaurant’s opening night. Very good it was too. I was partially right about the familiarity – there had been a restaurant called Maxwell’s on this site many years ago. Tuesday saw the arrival of my friend Richard from London. He was staying at Corrib Village too. You’ve heard of after-timing? How about before-timing? I asked Richard what his betting strategy was for the next two days. He told me he was just going to back Dermot Weld’s selected whatever the price. I told him he was bonkers and it made no sense to back a trainer’s runners indiscriminately. The rest is history. So that told me. I can’t remember any losers but there must have been some! 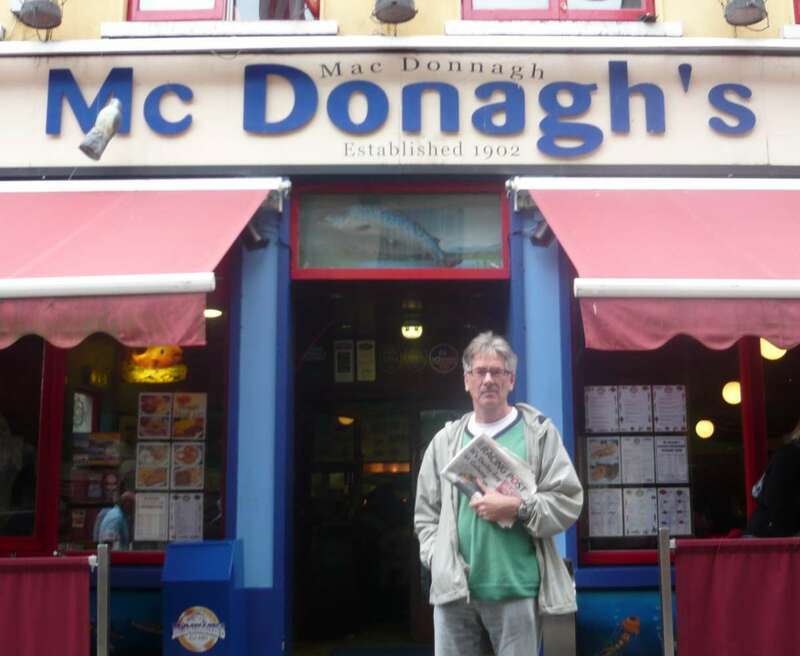 We went to McDonagh’s fish bar on more than one occasion. This must be the best fish and chip shop in Ireland. In fact it’s more than a fish and chip shop. It’s an excellent seafood restaurant too. I’d had no joy at the track on Tuesday. Winners were hard to find. That night we went to Maxwell’s. We received a very warm welcome. I was probably the only customer who’d been to the restaurant every night they’d been open. We both went for the delicious fish pie. Wine and water for drinks. Fed up with paying upwards of £4 a bottle for mineral water? Well here was a novel twist. A carafe of still water was free and for one euro you could upgrade to fizzy. We splashed out and ordered one of each. How refreshing. There are many half-price and free entry offers. So it is well worth enrolling and checking out what’s on offer. It’s free to join. Wednesday punting was no better for me (although Richard was still cleaning up of course!). There was one glimmer of hope on the horizon. I’d tipped up Richard Hughes (on my blog) to be top Goodwood jockey and we’d both had fairly large investments on him. In the end it was an easy pick-up as he rode a record breaking nine winners at the Sussex track. This would make a decent sized dent in my Galway losses. No pistol was purchased. On Wednesday night there was a problem with our accommodation. Corrib Village had overbooked. Over 300 nuns were due in town so we were shipped out to the B&B across the road. This was actually a very good establishment – Corrib Haven - the standard of accommodation and food being much higher than Corrib Village. Thursday we both made our way back to the UK. Richard flew Galway to Luton. I, of course, took the train to Dublin. Having had a terrific Irish breakfast at the B&B I was in Dublin in time for lunch at Davy Byrne’s. The price of Guinness jumped from 3.75 euro (Galway) a pint to 4.75 euro (Dublin) but that did not affect my enjoyment of the crab salad on offer. It was great to be in Dublin again if only for a few hours. For my next trip to Ireland I’m considering the Holyhead ferry to Dun Laoghaire as an alternative to a flight. I’m not sure whether the volcano has inspired this. I think it’s more likely to be nostalgia. The last time I made the boat trip across the Irish Sea was nearly half a century ago. I understand the crossing is a bit quicker now.